Back in 2011, I argued that Obamacare would lead employers to drop existing health insurance coverage and throw employees onto the mercies of the exchanges. (See this post and links therein.) Liberals, including no less than Paul Krugman, denied this. But it’s looking like it’s happening. Today’s Wall Street Journal reports that Wal-Mart, that paragon of the modern employer, is dropping coverage for 30,000 part-time employees. It joins Target, Home Depot, and UPS, who’ve already cut coverage. And, at the high end, the so-called “Cadillac tax” on generous insurance plans is also leading to cutbacks; JetBlue and FedEx are shifting employees into high-deductible plans. Meanwhile, Gallup finds that more Americans think the cleverly named Affordable Care Act has hurt (27%) rather than helped (16%) them—though a majority (54%) say it’s had no effect. 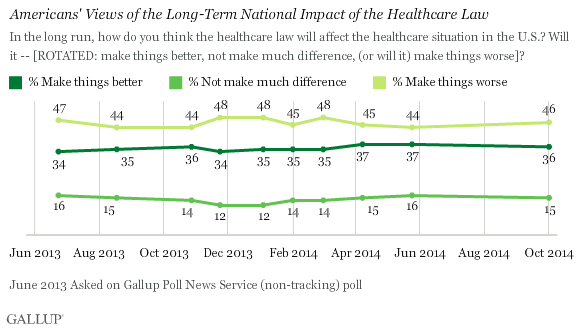 Almost half (46%) think the ACA will make things worse over the long term, and just 15% think it will make things better. Maybe they’re wrong. But the typical response of Democrats is basically to say they’re mistaken, and that the Act is the greatest bit of legislated social progress since Medicare. Except almost everyone loves Medicare. It’d be nice if everyone could have something like it. Are you sure UPS has cut health coverage for part-timers? I used to be a UPS part-time employee and Teamster long before Obamacare, and we had fairly good coverage because of the union contract. I haven’t heard of any such cuts, even with the new contract negotiated last year. I just googled in Google News and came up with nothing. Sheldon, it’s an ACA-inspired cutback of coverage for spouses of non-union employees. Thanks Charles for this information. I do recall the union negotiated health insurance was even better than what the production line supervisors got. And I forgot about all the other tiers of office workers etc. that were not on the union contract. suckers!